The musical bow (bowstring or string bow) is a simple string musical instrument part of a number of South African cultures, also found in other places in the world through the result of slave trade. It consists of a flexible, usually wooden, stick 1.5 to 10 feet (0.5 to 3 m) long, and strung end to end with a taut cord, usually metal. It can be played with the hands or a wooden stick or branch. 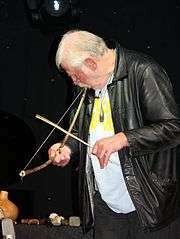 Often, it is a normal archery bow used for music. Types of bow are different mouth-resonated string bow, earth-resonated string bow, gourd-resonated string bow, bridged string bow, spiked fiddle, and bowed trough fiddle. Although the bow is now thought of as a weapon, it is not clear whether it was used in this way originally. A cave painting in the Trois Frères cave of southern France, dated to around 13,000 BCE, displays a bow being used as a musical instrument, so this use certainly has a long history. Musical bows are still used in a number of cultures today. It can be found as far south as Swaziland, and as far east as eastern Africa, Madagascar, and Réunion. and also outside of Africa, as in the case of berimbau, malunga (derivations of the African musical bow) or the Appalachian mouth-bow. In the United States a musical bow is primarily found in the Appalachian Mountains, where it is called a mouthbow or mouth bow. ↑ Nzewi, Meki and Nzewi, Odyke (2007). A Contemporary Study of Musical Arts: Informed by African Indigenous Knowledge Systems, Volume 1: The Root: Foundation, p.108. African Minds. ISBN 9781920051624. ↑ Sell, Rick. "THE APPALACHIAN MOUTH BOW: EASY TO MAKE, EASY TO PLAY!". 1 2 Lucia, Christine (2005). The World of South African Music: A Reader. Cambridge Scholars Press. p. 239. ISBN 9781904303367. ↑ "Musical Bow". Retrieved 2015-01-22. ↑ Best, Elston (2005). Games and Pastimes of the Maori. pp. 313–4. Retrieved 2015-01-22.